Constructed of three telescoping sections. 30% shorter when closed than the regular model. 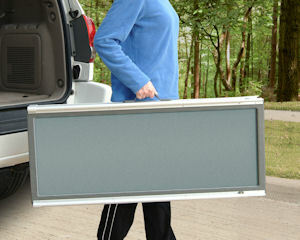 It is the lightest, strongest and most compact option for pet parents!. 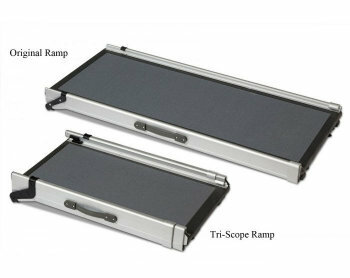 Incorporates multiple safety features including a high-traction walking surface to give pets a sure footing on steep climbs, four rubber feet to keep the ramp stable while in use, a safety release latch to prevent accidental opening and a convenient carry handle. Supporting up to 150 kg. 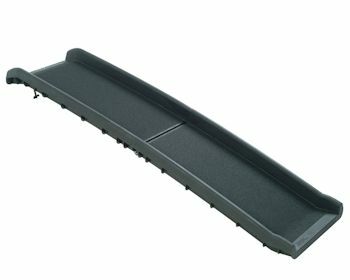 With the widest range of adjustability available, up to 90 cm high,” it can be fully extended to provide access to SUVs, pickups, and grooming tables, or shortened when space is limited or when the upper surface is lower, such as a bed, couch, or minivan. Extended: 70 – 176 cm. Width, including edge: 41 cm. Weight of the ramp: 5.7kg. Telescoping from 100cm to 175cm. To us on any length. High edges for extra safety. Rubber feet to keep the ramp steady while in use. Easy to carry comfortably with its convenient carry handle. 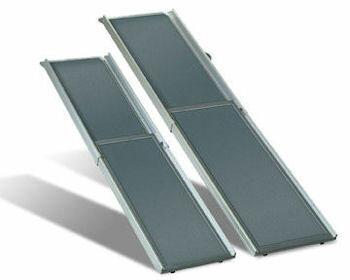 The ramp is flexible for extra walkcomfort for your pet. Safety Release Latch prevents accidental opening/extending. Suitable only for use by pets. 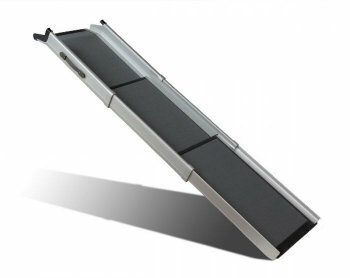 Weight of the ramp: 8kg. Telescoping from 120cm to 220cm. Weight of the ramp: 4.9kg. Folded 80 cm, unfolded 157cm.